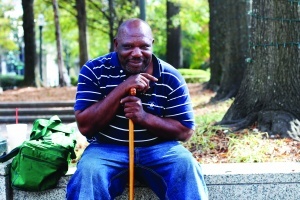 Leroy sat in Linn Park waiting for a ride to the bus station on a warm, November afternoon. He was not alone in the park; in Alabama, it is still warm enough for short sleeves in November, so people with no other place to go can sit outdoors comfortably. He leaned forward on his cane, a crutch he found necessary after a surgery left him with metal rods in his leg. His rough hands—one with stitches running across the palm—crossed one over the other at the crook of the cane. Leroy’s leg surgery left him unable to work, he explained. He draws a disability check for $925 a month and collects $16 in food stamps each month. After a divorce, Leroy found himself with no place to live. The bus he was waiting on this day would take him to Greenville, nearly 2 hours away from Birmingham, where his car was. He had $300 in his pockets—money he planned to give to a contact in Greenville to pay back a debt. It was all the money he had to his name. According to the study “A Needs Assessment of the Homeless of Birmingham and Jefferson County,” 29 percent of the homeless population in Birmingham fit the U.S. Department of Housing and Urban Development’s definition of chronically homeless. Chronically homeless people either have disabling conditions and have been homeless for a year or more or have been homeless four times within three years. Many of these homeless people said that “personal relationship issues” caused their homelessness. “Ninety-one percent report experiencing at least one undesirable life event over the last year. The most common events are job loss, death of a close friend, family member or partner, physical abuse, or problems with a spouse or partner,” the study says. According to county records, on Nov. 9, 2011, Jefferson County filed for bankruptcy. The debt of $3.14 billion made it the most expensive municipal bankruptcy in U.S. history at the time. Since then, the availability of jobs has been decreasing. Birmingham has an estimated homeless population of about 3,000 people. That is 0.13 percent of the overall population of the city living without a home. More people are without work and fewer of them are able to find employment. The loss of job infrastructure caused by being homeless creates a vicious poverty cycle that local activists and volunteers say is not easy to break. This is the first installment of a five-part series.